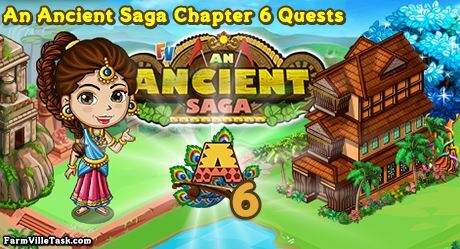 Help our friend who is going to meet Meera and Arya in FarmVille Jewel Thief, an Ancient Saga Chapter 6 Quests. Our friend need to convince them to help our friend with their intellect. On this chapter of the Ancient Saga Quests, we are going to craft 6 recipes at the ANTIQUE CENTER. Prepare ahead by collecting the bushels early. You can also get the bushels at the Bushel Swap. Note: Expected to be released on Monday (April 8th). Info: Crafted at the ANTIQUE CENTER and will need Pini Jambu Bushels x6, Beach Cherry Bushels x9 and Balsam Pear Bushels x6. Info: Crafted at the ANTIQUE CENTER and will need Pini Jambu Bushels x9, Cape Gooseberry Bushels x9 and Beach Cherry Bushels x6. Info: Crafted at the ANTIQUE CENTER and will need Ruby Strawberry Bushels x4, Irvingia Mango Bushels x4 and Dowefruit Bushels x4. Info: Crafted at the ANTIQUE CENTER and will need Balsam Pear Bushels x6, Twilight Mulberry Bushels x6 and Imagem Flower Bushels x6. Info: Crafted at the ANTIQUE CENTER and will need Red Bayberry Bushels x9, Cotton Burst Bloom Bushels x9 and Nagalinga Flower Bushels x9. Info: Crafted at the ANTIQUE CENTER and will need Hearty Custard Apple Bushels x6, Sunkissed Mango Bushels x6 and Twilight Mulberry Bushels x6.